We are happy to accommodate children from the age of 6 turning 7, and there is no upper limit. We are also more than happy to discuss a grown ups party, and in the evening should you so wish. You may bring champagne too! A deposit of 20% is acceptable if your booking is more than 12 weeks in advance, otherwise full payment is required at the time of booking. Do you send a booking confirmation? 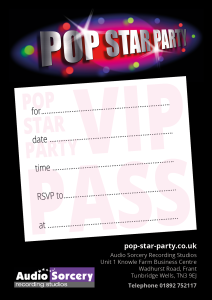 Once you have completed your booking with us, we will post you our party pack, with a letter confirming your time and payment details, a brochure and price list should you wish to upgrade, a Pop Star Party information sheet on how to prepare for the big day, and of course a generous helping of Pop Star Party invitations to hand to your friends! Can we upgrade our party booking later with more guests? Certainly! Just call us on 01892 752117 and let us know how many more singers you wish to bring. 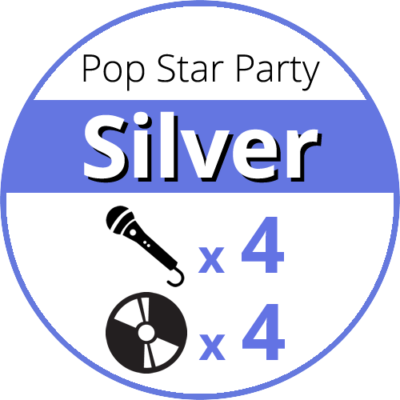 For one extra child the price is £15, or you can pay the difference between, for example, the Pop Star Party Silver and the Pop Star Party Gold to bring two more guests. 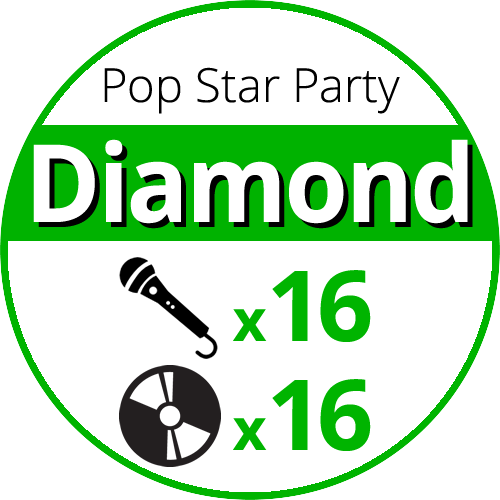 If you need to upgrade to a Pop Star Party Emerald (or Diamond) then the party durations should be taken in to account. Because these two parties (for up to 12 or 16 guests) require ½ more time (and include 2 songs) It may be necessary for us to move other sessions in our diary accordingly. We will of course try every avenue to accommodate your requirements. Quite often we are also asked whether a ninth person can be added to a party of 8 (Pop Star Party Platinum) without breaking the 2 hour (1 song) session time. We are happy to accept a ninth person in most cases for the additional head fee of £15. More than nine guests does mean a full upgrade to the Pop Star Party Emerald. Do you send out Invitations? Can we change our party booking date? We realise it can sometimes be necessary to change a booked party date - maybe a best friend is on holiday or simply can't make the date in question. We are more than happy to re-organise a date and time to best suit everyones availability. There is no penalty charge for this - providing your Party date is moved prior to 48 hours before the original booking. Is there free parking at your studio? Yes - we have lots of parking right outside our studio doors. Please be aware that children should be supervised outside at all times. Quiet, sensible behaviour is also required whilst outside. You can make up for it when you start singing! Is there a railway station near you? There are two railway stations near our studio. The main station is at Tunbridge Wells, and a cab is always present to bring you to us at Knowle Farm Business Park, Frant. Another station is Wadhurst and although closer, doesn't have cabs readily available, and is a treacherous mile long walk on a busy main road with no footpath. Our suggestion is to go with the Tunbridge Wells option and expect to pay between £10 and £15 for the cab each way. There are a few shallow single steps between the car park and the studio floor. Our doorways are quite narrow at 25 inches wide. We have a strong grab handle near the toilet. Please contact us to discuss any particular requirements you may have on 01892 752117. What songs can we sing? We have every song that has been a hit in the charts, including oldies, and current tracks. Search our library for popular song choices here. The preference is for an upbeat, happy pop or rock song. We don't need to know your song at the time of booking, but please do remember to print the lyrics for your track choice, ready for the day of your Pop Star Party. We'll have the backing karaoke track cued up in no time and ready to record when you get here! How many people can spectate? We suggest no more than 6 parents/relatives/guardians should stay and watch. 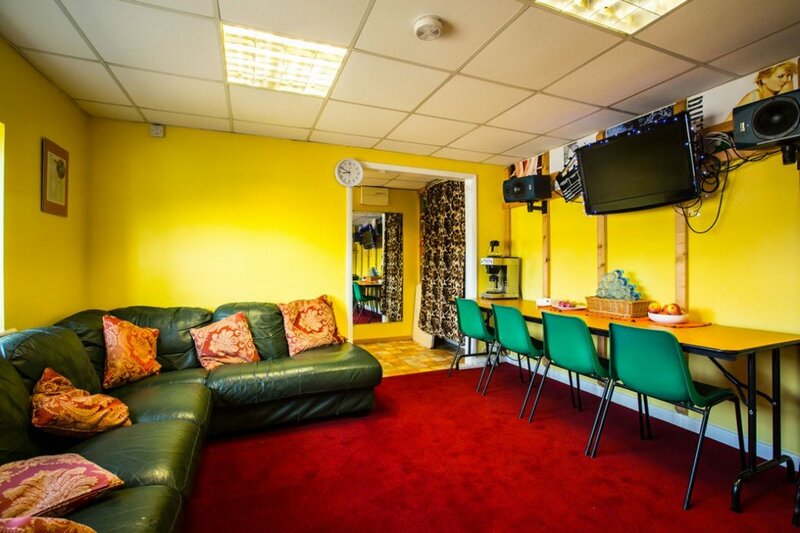 The Green Room is provided for your comfort which is shared with both studio 1 and studio 2. It has 8 green chairs, a big green leather sofa that fits 6 adults, and a large table for laying our food etc. There is a TV Screen and speaker system so you can see and hear the party when it's at full swing. Can we bring party food and cake? We provide tea, coffee, milk and sugar for spectators, and lemon or orange squash for the children. There is a small kitchen area connected to the green room with a refrigerator, sink and work surface. Glasses, cups, plates and cutlery are provided in the cupboards for your use. Bring your own cold party food, and a Birthday cake with candles (and matches!). They'll be time towards the end of your party to eat and sing Happy Birthday whilst the producer prepares your photo printed CDs to take home. Please wash and put away, vacuum and take your rubbish home. Bin bags are provided under the sink, and Henry the hoover is very efficient indeed! Are there places near by we can eat? 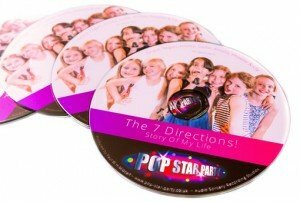 What is the duration of a Pop Star Party? For up to 4, 6 and 8 singers respectively. The party sings 1 song in our studios, and your allotted time of 2 hours includes snack eating and cake cutting towards the end of the session. For up to 12 and 16 singers respectively. The children are split in to 2 groups, and each group sing 1 song. The two songs can be different, or the same choice - your call! They take it in turns to record in the live room whilst the other group resides with the producer (and often heckle!). Your allotted time of 2½ hours includes snack eating and cake cutting towards the end of the session. Every singer will take home a CD which has been printed with the groups photograph and band name. Much, much cooler than sweets in a party bag! What happens if it snows? We are more than happy to re-organise your booking for another date and time if the weather is too dangerous to travel in i.e. settling snow and impassable routes. There's no penalty charge. What happens if you're ill? If the party girl or boy fall ill just before their arranged Pop Star Party then we are more than happy to re-organise another date and time. There's no penalty charge.